Sometimes I like to go up in my room, close the door and eat crunchy things while staring at the ceiling read. While doing this one day I was thinking it would be nice to have a blanket at the end of the bed, so I wouldn't have to crawl inside. That just leads to falling asleep. Should I make a blanket, or buy one? I am sure every knitter has had this dilemma. You feel like you should make it because you can, but I don't always do that. 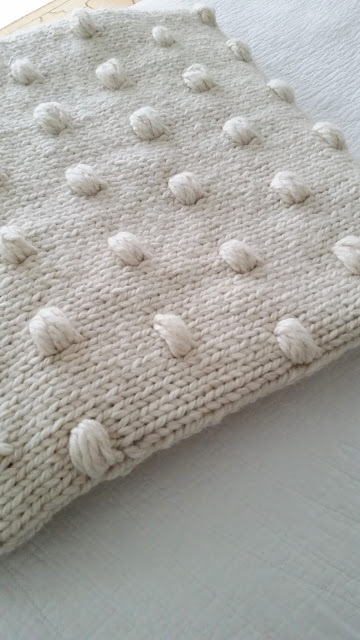 If I find the perfect knit, I will buy it. I used to feel guilty about this, but I got over it. 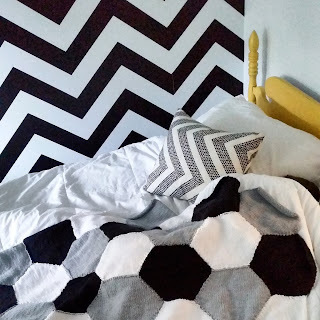 I decided I wanted a really thick, squishy blanket and after looking around, I could not find what I wanted, so I decided to write a pattern and I wanted to share it with you. Maine (because that is where I live) Squeeze (this is very squeezable) is a very thick throw that measures 48" by 58" and knit using two strands of yarn at once. This yarn is a dream. It is an Alpaca blend, so it feels and looks like alpaca but it can be washed in the washing machine and is affordable. Any other bulky weight yarn will do. Next row (RS)K 4 rows for bottom border, BO weave in ends with darning needle. Please email me with any questions you have. Enjoy! This is beautiful, Katie! I clicked over on the yarn and I couldn't figure out which one it is...can you give more details? I'd appreciate it! I love this! So cute. I think I'll make it for my mom for Christmas. How long did it take you? It just took a few weeks! It knit up so quick!! What weight of yarn is this? Is it a 5 or 6? The yarn you recommend loots great, but has reviews on that site I wanted to ask you about. 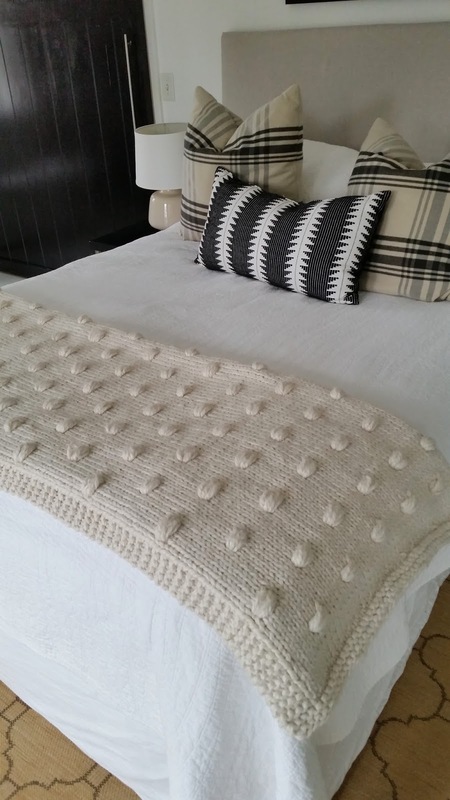 Many people complained that it sheds quite a bit while knitting with it. What's your experience with it on that front? And did it shed much in your first few washings of it? It does shed, but after washing it, it is much better. Honestly the yarn is so gorgeous and affordable it didn't bother me that it shed a bit! Thanks for that feedback on the yarn. And I just noticed this yarn will be 40% off on Black Friday. Alas, there's no Joann Fabric near me. I hope they offer the deal online!! This yarn is available now both in store and online for 40% OFF (free shipping over $60) at joann.com! So each skein is now $5.99 down from $9.99, in case anyone wants to make it cheaper. Yay!! Thank you for sharing! I'm knitting this and I don't understand how to make the clusters. How do you knit the 3 stitches on the cable needle if you've wrapped the yarn around it? 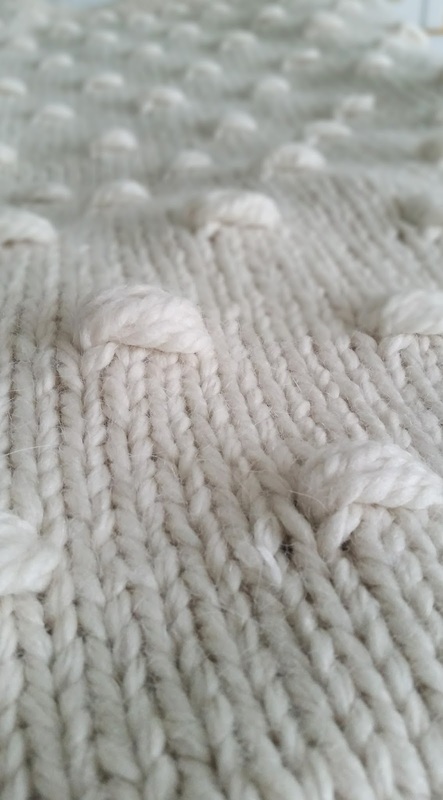 Can you party some pictures of how to make these and how the yarn is layered on the cable needle? Thanks so much! Klhrabosky@gmail.com I meant post not party. Yes, please post pictures of how to make the clusters. I am a visual learner and I am not sure what to do with the cable needle. Thank you!! Slip three stitches on a cable needle, wrap yarn around bottom, leaving cable needle visible, then knit from cable needle. Your cable needle is your knitting needle on your left side. Hope that helps. This is Kara again. I figured out the clusters, thanks. I had errors on the stitch count on the second row of clusters, though. When I used K1, cluster, K4*, the clusters were not at all centered in relation to the first row of clusters (they should be centered between the prior row of clusters). So watch this visually as you do it (I don't know why I had problems as I see from your pic you did exactly as the pattern - maybe I need to count up all my stitched in the row again and make sure I didn't add one or two by mistake). Anyway, I modified the spacing counts to align visually for my blanket and its working great. 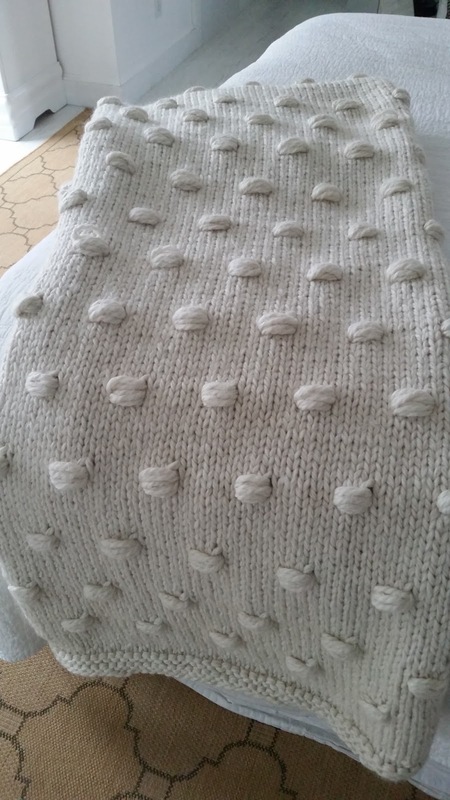 I also found that using #13 needles with a double layer of yarn made the blanket too thick and stiff for my taste. 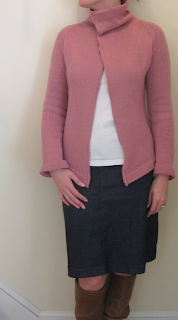 I suggest trying a few swatches in various needle and yarn thicknesses before making this one to pick what suits you. So for those wondering about options, I am now making it on #15 needles with 1 skein of yarn thickness (my knitting it medium tension, I think). I kept the clusters at 12 wraps of only 1 strand of yarn, to make them comparable to the 6 wraps with 2 strands at once as is in the original pattern. Depending on how big you want the clusters and how loose or tight you wrap them, you could also wrap it 8-9 times and get a nice effect too. I'm using the Buttercream yarn from Joann and love it - thanks for the rec!! Ahhh, yes. Of course! That makes sense now. Just made this in single strand for my mom in AZ. Love it. I LOVE this pattern! Can you please explain a little more how to make the clusters? When you say wrap around the bottom, what bottom are you talking about please? 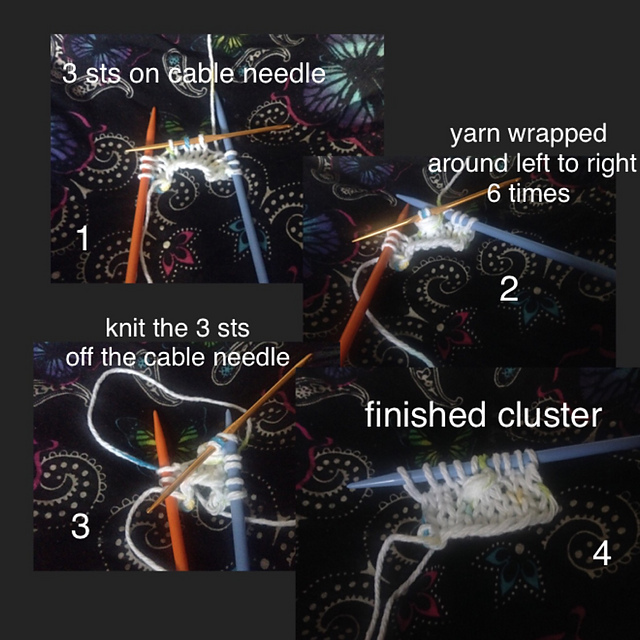 I posted a photo showing the cluster in 4 steps. Click here for a visual. Sorry about the deleted posts. I was trying to figure out how to insert a live link! Hello, I finally purchased the yarn, needle size and downloaded the pattern of your beautiful Maine Squeeze afghan/blanket. 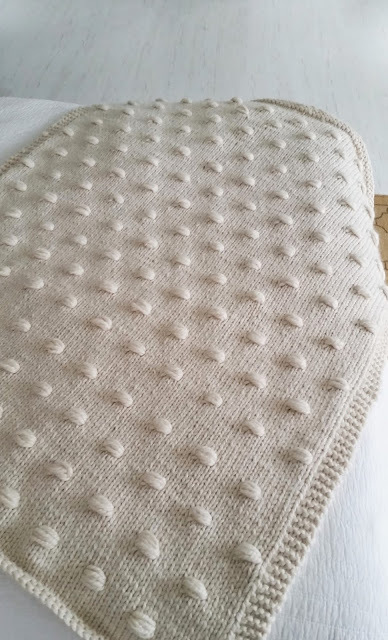 I have knitted about 8 rows and am finding it a little bit too bulky and actually think my $20 circule, size 13 needle may need to have a longer cord. My question is, do you think that I could knit your same pattern, using same bulky yarn with only using 1 strand instead of the 2 strands? would those bobbles work on it as a single strand? Thank you for your reply. This is the main reason why most students search for online assignment Services Australia over the internet and choose only the most proficient and trusted academic writing experts. Law assignment help Australia in understanding how legal theories and concepts can be enforced in the real world. Structuring an essay successfully is a difficult task, therefore My Assignment Services serve students with the most reliable Accounting Assignment Help, we have the best team of accounting writers that help you in the best possible way, All the experts working under the assignment help China service are trained to give extra attention to the assignments and ensure no error creeps in.